… and how you can – easily, too. Are you one of the millions of people, all over the world, suffering from Chronic pain? 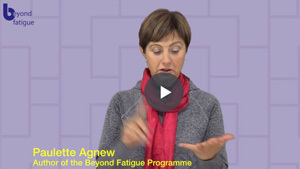 I’ve created a programme called Beyond Fatigue. It’s the world’s first course online movement and support course designed to directly help you, help yourself. probably don’t have the training and knowledge to recognise and fix this problem, luckily I did. Yes, I’ve struggle for over 15 year with Lyme disease with it’s associated overwhelming fatigue and five of those years practically house bound. It was because of this Beyond Fatigue was born! After years of knowledge and practical experience I’ve jam-packed this informative, potent, progressive home programme. joints and conserve muscle tone. ‘As a family doctor, I’ve always been skeptical about ‘miraculous cures’, but I have been so impressed by Paulette’s recovery using this programme. It is clear to me that it can be of enormous benefit to people with chronic conditions and debilitating diseases such as fibromyalgia, chronic fatigue, Lyme, arthritis and any condition that stops people moving. This programme takes you through a specific series of classes containing remedial, restorative and therapeutic exercises taking you from lying in bed to sitting to standing. Day by day, you will gain greater flexibility, strength, relaxation, self awareness and mobility. Through the short inspirational talks, you will learn many of the essential keys to wellness and recovery, and top up encouragement and reassurance. You will experience slow moving exercises, combined with core stability and breath. With regular practice, you may also notice an improvement in your concentration and focus ability along with reduced stress and emotional strength. Do you want your normal life back? Then sign up and let’s get going. 10 mini inspirational pep talks, at the start and end of every class. 10 ‘Inspirational Touchstones’ – Relevant quotes and passages for contemplation. You will learn how to relax tight joints and muscles and work with the fascia throughout the body. Enhance vitality through breathing techniques and detoxification at cellular levels. Core strengthening exercises which affect not only the physical body but also mind and emotions. Conquer the fear and pain associated with long term illness and loss of mobility. Increase circulation and lymph drainage throughout the body. Activate the relaxation response and hence stimulate the healing power of the body. Use Isotonic movements to ‘build muscles’ whilst sitting around. Feeling isolated and down? Experience encouragement to keep going. Get more energy by supporting your mitochondria and ATP production in every cell. Did you know laughter is a key to recovery? Micro-movements open up a whole new world of possibility within disability. Develop your coordination and balance and assist brain plasticity. Learn a priceless stress busting sequence to use for the rest of your life. Lie or sit back and enjoy gentle, guided relaxations. Give yourself permission to heal – one of many essential Wisdom Bite short talks. Put your feet up! – A gravity enhanced sequence using only the wall. Oodles of tips and easy attitudes that super power your healing journey. Research shows that daily movement and exercise help us live longer, slows the progression of diseases, reduces pain, builds confidence, reduces heart disease. We cannot live healthily without daily exercise and movement. This course is ideal for anyone wishing to practice simple and safe, movement and breathing exercises to improve health and overall well being. It is a ‘gift’ to those wishing to grow as a person through their illness, coming out stronger, more alive and aligned within themselves. It is especially valuable for those with a chronic illness, limited mobility problems, fatigue symptoms or the elderly. It will also aid people with Alzheimer’s, Arthritis, Fibromyalgia, burnout, obesity and other debilitating health problems. you wish to practice without turning on the computer. After five weeks you will have full access the whole course to go back and relearn or listen to deepen your awareness and knowledge. ability. The course contains excellent material which can be integrated into a normal busy life, maintaining flexibility and strength for many years to come. The complete programme costs only £89. You will have access to content equivalent to 11 private one hour consultations worth £990. Incredible value for money and offered because I know how hard it is for people with chronic illness to pay for endless therapists and treatments, especially when out of work.